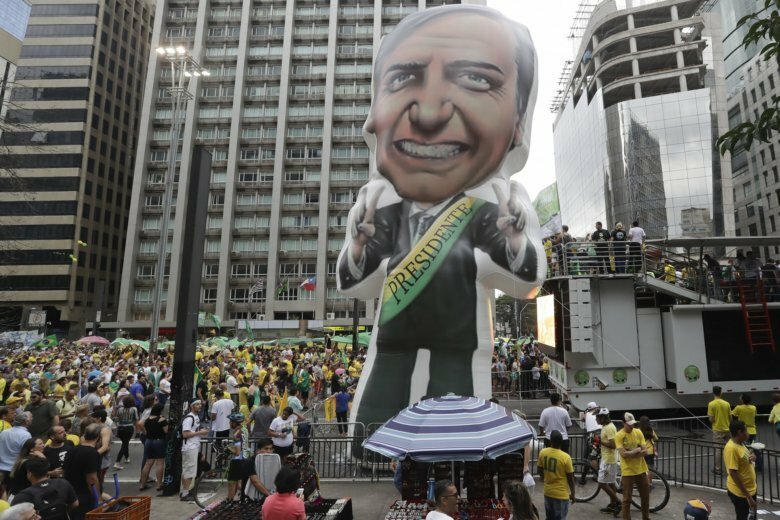 SAO PAULO (AP) — Thousands of people have flocked to one of the main avenues in Brazil’s biggest city in support of Jair Bolsonaro, the far-right presidential front-runner in next week’s election. Waving Brazilian flags, the crowd in Sao Paulo cheered loudly as leaders of his Social Liberal Party promised them victory in the Oct. 7 vote. Bolsonaro is currently leading polls ahead of that vote. But if no one candidate wins the majority of votes, the race heads to a second round, which polls show him losing. “He is the only one who can pull Brazil out of the sea of corruption in which it is drowning,” said hardware store owner Felipe de Almeida. Sunday’s protest came a day after thousands protested against Bolsonaro and his comments about gays, women and minorities.